The Smithsonian Castle in the 1850s. 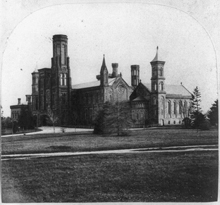 The Smithsonian Castle in 1867-69, when Cluss was renovating parts of the building. It is little known that Adolf Cluss did a great deal of work on the Smithsonian "Castle". After a damaging fire in December 1865, Adolf Cluss was hired by the Institution's Building Committee to reconstruct the damaged structure. Cluss came to the Smithsonian "warmly recommended" by the Mayor of Washington for his work designing local school buildings. He remained the primary architect for the Institution until 1887. On the exterior, he was careful to remain remarkably faithful to the building's original exterior appearance. On both the south and the north towers, he reproduced the original appearance and such details as belt courses, window jambs, pilasters, columns and buttresses. On the interior, however, he introduced new structural systems designed to stiffen the walls and to provide fireproof floors throughout. At his client's urging, he introduced new spaces for office and for storage where the original architect, James Renwick Jr., had designed lofty vaulting ceilings in character with the medieval-revival facade. Cluss designed both of the elaborate cast iron staircases still in the building in a style combining reference to the medieval with later design influences. When asked to reconstruct the west wing of the building to prevent the possibility of fire, he used a modernized Romanesque style with elements of design reform. The distinctive color scheme he envisioned for this space has recently been partially restored. Cluss proved in his work at the "Castle" that he was a dedicated historic preservationist on the exterior and a modernist on the interior.